By Trevor McIntyre: Golden Boy Promotions president Eric Gomez is very interested in a fight between Saul Canelo Alvarez and WBA Super super middleweight champion Callum Smith in the UK at Wembley Stadium in 2019. This would be a fight where Canelo would likely be the underdog. Smith is huge, powerful, and a devastating body puncher. However, Canelo is a very good body puncher as well, as he displayed in his recent knockout victory last weekend. Canelo would definitely be earning his new $365 million, 5-year contract with DAZN if he does fight Callum Smith next. That fight would give DAZN a lot of value for their money, and likely bring in a load of new subscribers to their streaming service. This would take the ultimate courage on Canelo’s part to fight a giant fighter like Callum, who is for all intents and purposes, a light heavyweight that boils down to 168 to fight at super middleweight. If Canelo is going to fight a fighter as big as the 6’3″ Smith, he might as well move up to 175 to take on IBF champ Artur Beterbiev, WBA belt holder Dmitry Bivol or WBC champion Oleksander Gvozdyk. Smith is just as big as those guys after he rehydrates for his fights at super middleweight. Canelo (51-1-2, 34 KOs) is coming off of a devastating third round knockout victory over the highly popular British fighter Rocky Fielding (27-2, 15 KOs) last Saturday night at Madison Square Garden in New York. If the Canelo vs. Smith fight happens, it would need to take place at the giant 90,000 seat Wembley Stadium in London, England. That’s where Golden Boy Promotions wants the fight to take place. They’re not interested in staging the Canelo-Smith fight in Callum’s backyard in Liverpool at Anfield Stadium, which has a seating capacity of 54,074. Despite being very talented, Callum isn’t a big star in the UK, and Canelo isn’t well known among the casual fans. There’s a very good chance that Canelo vs. Smith wouldn’t sell out Wembley Stadium. Callum’s promoter Eddie Hearn of Matchroom Boxing would likely explain to Golden Boy that the Canelo-Smith fight wouldn’t sell enough tickets for Wembley Stadium to make it worthwhile to put it there. Smith’s popularity isn’t on the level of the stars in the UK like Anthony Joshua. Hearn is trying to turn the quiet and unassuming Smith into a star in the UK, but thus far it’s not happened. Smith’s popularity will obviously soar in the UK if he faces Canelo and beats him, but right now he’s not a huge star. For Eric Gomez of Golden Boy to be talking about wanting to match Canelo against Smith, they had to have already scouted out the British fighter and deemed him someone that their Mexican star can beat. Canelo already knocked out Callum’s brother former WBO junior middleweight champion Liam Smith in the 9th round on September 17, 2016 at the AT&T Stadium in Arlington, Texas. Over 50,000 boxing fans showed up to watch Canelo dominate and top Smith in a mostly one-sided fight. Callum would obviously be looking to avenge his brother Liam’s defeat by Canelo if the fight were to be made. 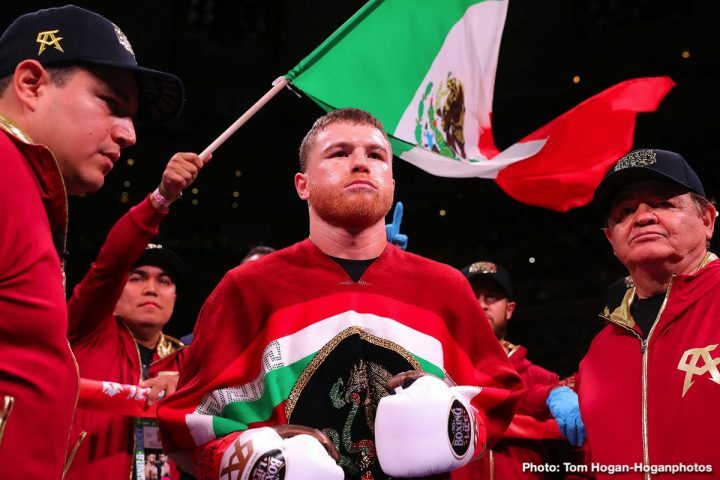 It was thought that Canelo Alvarez would return to the middleweight division to defend his WBA/WBC 160 pound titles after his win over Fielding. There are still a number of potentially interesting fights for Canelo at middleweight against the likes of Daniel Jacobs, Gennady Golovkin [trilogy], Jermall Charlo, Billy Joe Saunders, Demetrius Andrade and Sergiy Derevyanchenko. Those are all great options for Canelo’s next match on May 4 at the T-Mobile Arena in Las Vegas, Nevada. Golden Boy has already booked that venue. With Eric Gomez now talking about wanting to have Canelo fight Callum in London, it makes it unclear whether he’ll still be fighting in Las Vegas on May 4. Canelo vs. Smith wouldn’t draw the same kind of crowd in Las Vegas as it would in London or Liverpool. This would be a bold move by Golden Boy to have Canelo take on the 6’3″ Callum, as he’s viewed by many boxing fans as the #1 fighter in the 168 pound weight class today. Smith, 28, is in the prime of his career, and he’s coming off a 7th round knockout victory over George Groves in the World Boxing Super Series 168 lb tournament on September 28. That was competitive for the first six rounds. In the 7th, Smith hurt Groves with a left hook to the head that caused him to stagger backwards. Smith then jumped on Groves and landed a flurry of shots that caused the referee to stop the fight. It was over so quickly. The way that Smith was able to change the complexion of the Groves fight within seconds would make him a dangerous opponent for the 5’9″ Canelo, who is a lot shorter and lighter than the 5’11 1/2″ Groves. Canelo would be giving away six inches in height and reach against Smith. However, Smith is a vicious body puncher, and he prefers to give away his height and fight on the inside. Canelo wouldn’t have to deal with Callum staying on the outside all night long like a normal fighter would if he had a big six inch height advantage over a shorter opponent. Callum is not that good of a long range fighter. Canelo’s fight against Fielding last weekend brought in over 20,000 boxing fans at Madison Square Garden in selling it out. That’s pretty impressive given that Canelo’s fan base is located on the West Coast of the United States. Last Saturday night, Canelo proved that he’s a huge craw in the East Coast as well. What was so impressive about that fete was the fact that Canelo was fighting an obscure opponent in Fielding, who American casual boxing fans had never heard of. Many of the fans that showed up to see Canelo fight didn’t care that he was fighting someone they’d never heard of. They just wanted to see Canelo fight. It’s likely that Callum’s promoter Eddie Hearn will try nd persuade Golden Boy to make the Canelo vs. Smith fight in Liverpool. That’s where Smith’s fan base is. Would Callum’s large Liverpool fan base be willing to make the long journey from that part of the country all the way to London to see him battle Canelo on the night? Liverpool is on the other side of England, and very far away from London, It would be a long train or car journey to get from Liverpool to London for Smith’s boxing fans. As such, it’s unclear whether enough of his fans would show up to help sellout Wembley Stadium in London. Canelo made short work of what was supposed to be a difficult opponent for him in the 6’1″ Fielding. Before the spectacle was over, Fielding had hit the deck four times in three rounds. Unfortunately for Canelo, he didn’t receive the full credit that he should have due to many boxing fans making light of his victory, saying that Fielding, 31, was only the WBA ‘secondary’ super middleweight champion and not the main champion. The World Boxing Association has TWO champions in the same weight class at 168. Canelo now holds the secondary WBA belt, while Callum Smith holds the main WBA strap at super middleweight. There are easier options for Canelo at 160 than at 168 fighting Callum Smith. If Canelo wants to become a huge worldwide superstar, then facing Callum in England would be one way for him to achieve it. But this fight would be a risky one, unlike his last contest against Fielding, and there would be a high chance that he could lose to Smith. If Canelo returns to middleweight, he could face IBF champion Daniel Jacobs on May 4 on DAZN, and he would have a good chance of winning that fight. Although Jacobs, 5’11”, is basically a small super middleweight, he’s not as powerful as Callum, and he’s a lot shorter than him. Canelo would have an easier time potentially beating Jacobs than he would Callum. Smith was exposed in some respects in his fight against Nieky Holzken last February in the World Boxing Super Series. Holzken, who comes from a kick boxing background, gave Smith a lot of problems with his athleticism in going the full 12 round distance with him. Although Smith still won the fight by a 12 round unanimous decision, he looked uncomfortable throughout. Canelo is a lot more talented than Holzken, and he has just as much athleticism. There’s a very good chance that Canelo would get in close and do the same thing to Smith that he did to Fielding last Saturday night. If Smith doesn’t get to Canelo early, he’ll get stopped in the same way that Fielding did. Smith’s torso is too long, and it would be an inviting target for Canelo’s powerful body punches. The fact that Smith wouldn’t even try and fight on the outside would put him at a disadvantage against Canelo.